The process of capital allocation is one that is critically important for corporate management teams to perform effectively. Indeed, allocating a firm’s capital is the primary job of any management team, as it is they who are responsible for taking the firm’s assets and achieving the best returns possible from them for shareholders. How these decisions are made and where the capital ultimately ends up going can have enormous implications on the business and shareholders over the long term. Thus, it is critically important that shareholders understand how their capital is being allocated. There are several ways a company can allocate its capital, each of which has differing impacts on shareholders and ultimately, returns. In no particular order, the five ways a company can allocate its capital are: mergers and acquisitions, investing in organic growth, repurchasing shares, paying down debt, and paying a dividend. Every company has a different mix of these allocation methods, but the best ones efficiently balance the needs of these, resulting in high returns on invested capital, or ROIC, as well as strong shareholder returns. Getting this mix right means shareholders can expect strong returns on their own investment in the stock. One company that does a terrific job of allocating capital efficiently is Applied Materials (AMAT). This company has a strong history of not only producing high rates of ROIC, but also in returning cash to shareholders directly via dividends and share repurchases. Indeed, Applied Materials’ efficient capital allocation has set shareholders up for robust returns moving forward as it invests in organic growth while being able to provide more immediate returns to shareholders as well. The average analyst estimate is for 11% average annual earnings growth in the coming years, continuing a tradition of strong growth from Applied Materials thanks in part to its efficient allocation of capital to growth projects. Applied Materials is a global leader in materials engineering solutions that produces chips for advanced displays for high-tech products. The company boasts 12,000 patents in its portfolio and spends almost $2 billion on research and development yearly, allocating significant capital to ensure it can continue to grow. The company is in a highly competitive market but given its position as the leader in the sector, Applied Materials is certainly well positioned to continue to achieve success. Indeed, its competitive advantage is in its dominant position within the lucrative television and mobile device markets. These continue to be growth areas globally and certainly for Applied Materials as well, which is why it invests so much capital in research and development to maintain its leadership position in these categories. The management team recognized years ago that these would be long term growth areas and thus, set its capital allocation strategy accordingly. Apart from that, Applied Materials uses its capital to focus on innovations, such as its recent announcement of using cobalt as a substitute for copper in its chips. The company is investing for the future of big data and one way it is doing that is to improve the performance of legacy products. 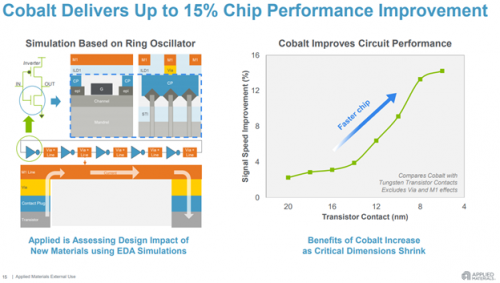 Cobalt promises to improve chip performance and thus, allow Applied Materials’ customers to process data more quickly than they otherwise would. This is an example of how Applied Materials’ uses its capital allocation strategically to invest in areas that will produce more cash than they consume, creating long term shareholder value. Applied Materials’ recent earnings release showed continued strong growth as revenue increased 20% year-over-year and adjusted earnings-per-share rose 40%. Revenue and gross margins came in above forecasts in Q3 as Applied Materials continues to reap the rewards of prudent capital allocation in past years. However, guidance for Q4 was slightly below expectations, leading to a significant decline in the share price. So far this fiscal year, Applied Materials has allocated a total of $4.9 billion to shareholders via dividends ($410 million) and share repurchases ($4.5 billion). This commitment to shareholders is in addition to the $1.8 billion it spends on research and development annually in order to ensure the company can continue to grow. Applied Materials doesn’t need all of its available cash in order to invest appropriately for the future, a desirable condition where its investable cash exceeds the opportunity for reinvestment. Thus, it allocates excess capital back to shareholders in the form of dividends and buybacks. This is the mark of a great business as Applied Materials can invest for future growth on an ongoing basis while simultaneously providing income for shareholders and reducing the float. Applied Materials has achieved ROIC rates in excess of 20% in recent years as it continues to focus its investments on the right areas for future growth. An example is in the transition to cobalt from copper, an expensive but prudent investment that will allow Applied Materials to stay on the leading edge of chip design for years to come. With high rates of ROIC, shareholders can reasonably expect strong, continued earnings growth in the years to come. Applied Materials – along with its competitors in the semiconductor sector – has significantly underperformed the S&P 500 recently. The company’s Q4 guidance has provided investors with a unique opportunity to own a business that has high rates of projected growth, a ~2% dividend yield and a multi-billion dollar buyback program, all thanks to prudent capital allocation. With the stock trading for less than nine times earnings estimates for this year and double-digit growth projected by analysts, the stock certainly looks like a buy. Finding companies with high rates of ROIC, a decent dividend, a sizable share repurchase program and a very low valuation is extremely rare. However, Applied Materials fits all of those descriptions and with a strong history of capital allocation, the stock should perform well in the years to come.